As you might or might not know, I’m doing research at present into Chinese Vocabulary Acquisition focused on Spaced Repetition Systems. One of the areas I’m looking at is Chinese orthography, specifically Chinese radicals and how it influences word recognition. I’ve read through quite a lot of papers and interesting stuff happens when you read Chinese characters. One, is the influence of Chinese radicals in processing words and characters. But they all aren’t positive. Sometimes, due to the development of Chinese, some regularities got lost by the way side. Sometimes Chinese radicals just don’t play nice. Before we start, these effects are only focused on semantic-phonetic compounds, which form about 81% of Chinese characters. The others are pictographs, ideographs and indicatives, which are not discussed below. Semantic-phonetic compounds usually have the semantic radical on the left and the phonetic radical on the right. An example: 洋 (Yáng - Ocean) which has the semantic radical on the left ,氵 (water), and the phonetic radical, 羊 (Yáng), on the right. To see dissections of other characters, use HanziJS. Frequency is a complex effect. This refers to both frequency of the character and the frequency of the radical. Higher frequency characters receive less attention in decomposition. Think of it as if you are used to something, that you don’t look at the details anymore. Like the path on your way to work. The opposite, lower frequency characters, due to the unfamiliarity receive more attention to their radicals. 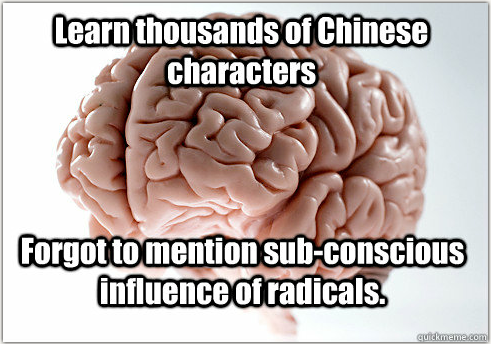 When it comes to the frequency of the radical, the high frequency radicals provide more correct inferences, but when you learn the function of radicals, say you are at the elementary stage of Mandarin and starting to feel the effects of the frequency, when you learn a new radical and what it portrays, you’ll learn it easier if it’s a low frequency character. Combinality refers to how many characters a specific radicals combines with. 氵 for instance is one of the radicals with very high combinality. This one is pretty straight forward, high combinality radicals are named quicker and more accurately. However, when the combinality is large, the phonetic radical aids in recognition. Think of the radical氵 again, it forms with a lot of characters. The phonetic radical, usually on the right, thus aids in helping you figure out what the character is. Regularity refers to how similar the pronunciation of the phonetic radical and character is. 洋 for instance would be regular. Both the character and phonetic radical (羊) have the exact same pronunciation: Yáng. If a character’s pronunciation is regular with the radical’s pronunciation, then they are usually named faster and more accurately. Once again, in low frequency characters, the regularity helps a lot in naming of the character. Transparency refers to how clearly the semantic radical portrays the meaning of the character. This is very similar to regularity above, but refers to semantic radicals. More transparent characters are identified quicker and more accurately. So for instance, using 洋 again, which means ocean, the water radical is transparent with the character meaning. Consistency refers to how reliable a radical is in conveying information when it combines with other characters. Think of combinality above and how consistent the relationships are between the radical and the character. Once again if the radical has high consistency, then the naming of the character would be quicker and more accurately. This post talks about only one subset of Chinese characters, the semantic-phonetic compounds. A study found, when testing naming latencies, that regular and consistent semantic-phonetic compounds were actually named faster than non-semantic-phonetic compounds (pictographs, ideographs and indicatives). However, non-semantic-phonetic compounds were named faster than irregular and inconsistent characters. This just shows how strong these effects can be! How does this affect my learning? If all semantic-phonetic compounds where regular, consistent, transparent, had equal combinality and frequency was controlled, then you’d have the perfect reading system. These effects would be null and void and Chinese would be much more uniform. Unfortunately, it’s not, as this why these effects arise and influence you. As much I would love to give you an awesome solution to watch out for these effects, the best advice I can give you is this post. You have to become aware of these effects. Start looking at characters like puzzles with different information in them. Together all these pieces form the final image. Some pieces have been chipped and or don’t help with the final picture you want to form, but if you know what these pieces are, then you can fill in the relationship between them. After doing this research (with more to go!) I’ve been looking at Chinese characters differently. It’s quite amazing how fun it becomes to figure out the relationships between characters and their radicals. Good luck!